It was a rookie error really and considering I can no longer honestly tick the juvenile box on questionable questionnaires, I have no one to blame but myself. Frenchie, newly landed from the Rue du Nil via Eurostar in Covent Garden, suggests that dishes from its confusingly structured menu can be shared. Well of course they can be shared, but it doesn't mean they're suitable for sharing. Portion sizes are on the, shall we say, modest size. 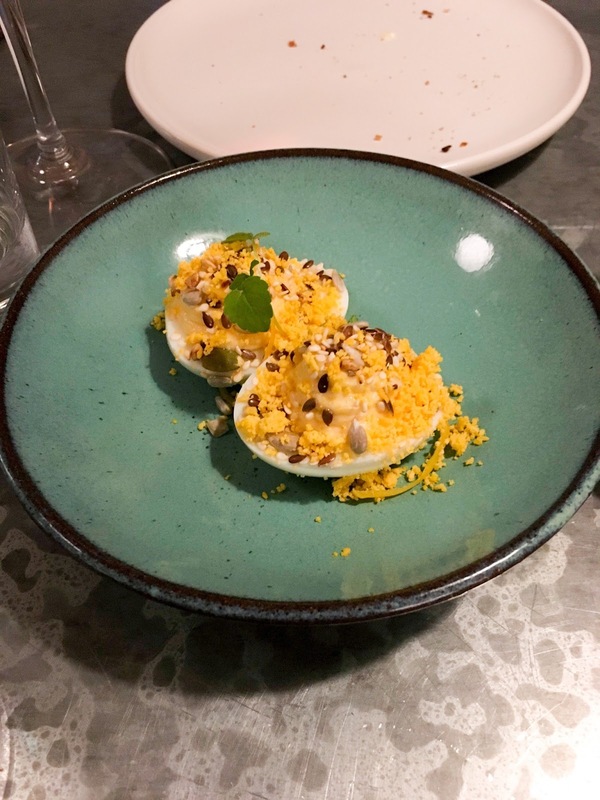 This means you'll need a couple of their foie gras dishes at £14 a pop unless you're happy with a thumbnail-sized mini mouthful. Likewise, pasta dishes can be shared, but only if you fancy smearing some ragu across the metal tables. So, my advice is to ignore the advice on the menu. These dishes aren't for sharing. 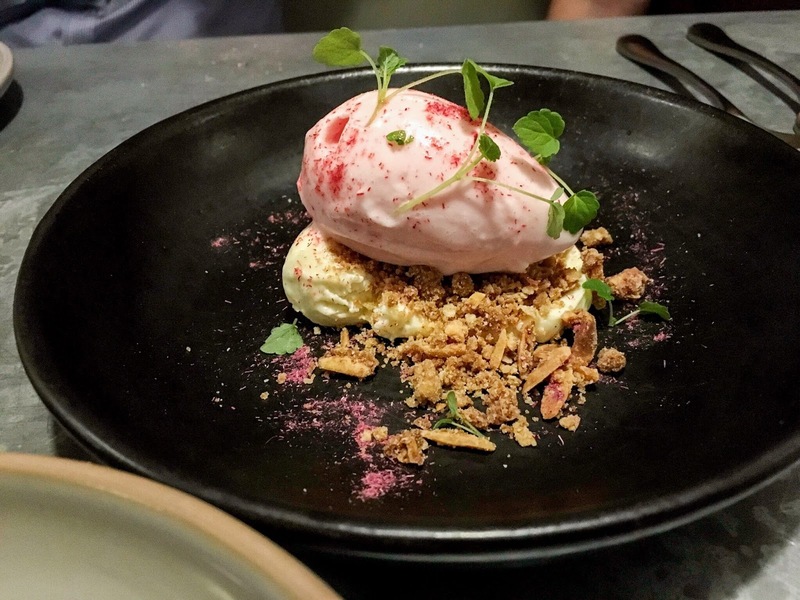 Treat Frenchie like a three course (ok probably four) kinda place and you'll enjoy it. The food is well executed, the wine is good, the space is open and light and service is...let's say the service is still a work in progress. 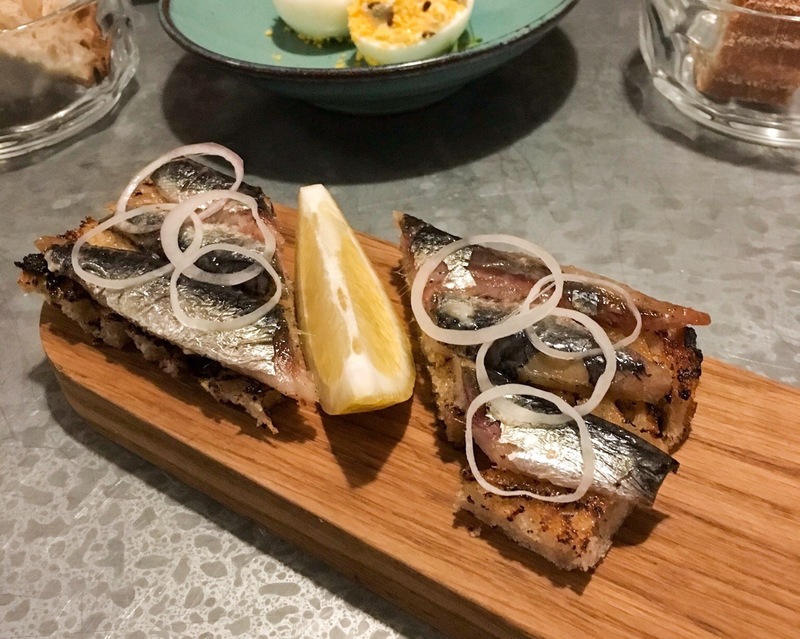 The top row of the menu is snack-based so we chose smoked anchovies with Neal's Yard salted butter (£6), Bacon Scones with Cornish clotted cream (£5) and Clarence's Court Egg Mimosa (£3 an egg). The anchovies were indeed lovingly smoked but this effect was tamed by some pickled onion and the oiliness of the fish itself. Order them. 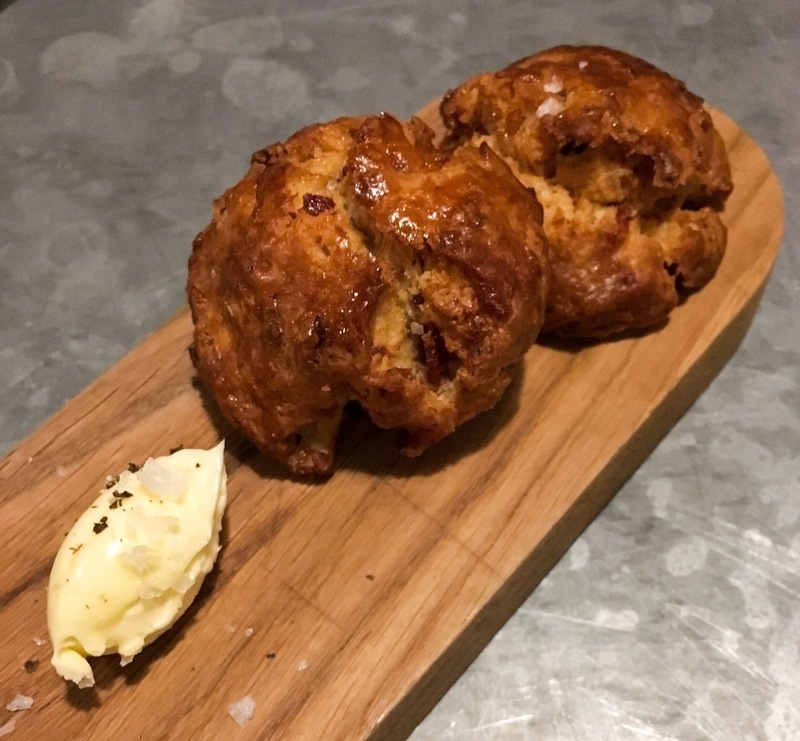 Bacon scones were a hit, as you might well imagine. Like shooting fish in a barrel really. Imagine crispy, chewy lardons amped up to taste like very bacony bacon, interspersed through a slightly crumbly dough. The effect was reminiscent of American candied bacon to these somewhat traveled tastebuds. The clotted cream served little purpose apart from making it more calorific. Thankfully the half scone I had was gone in two dainty bites. The hard boiled eggs were lovely little morsels but I couldn't work out the ingredients apart from the egg, obviously. Unfortunately there was no champagne nor orange juice in there. Still, the seeds scattered on top added some texture to these light bites. 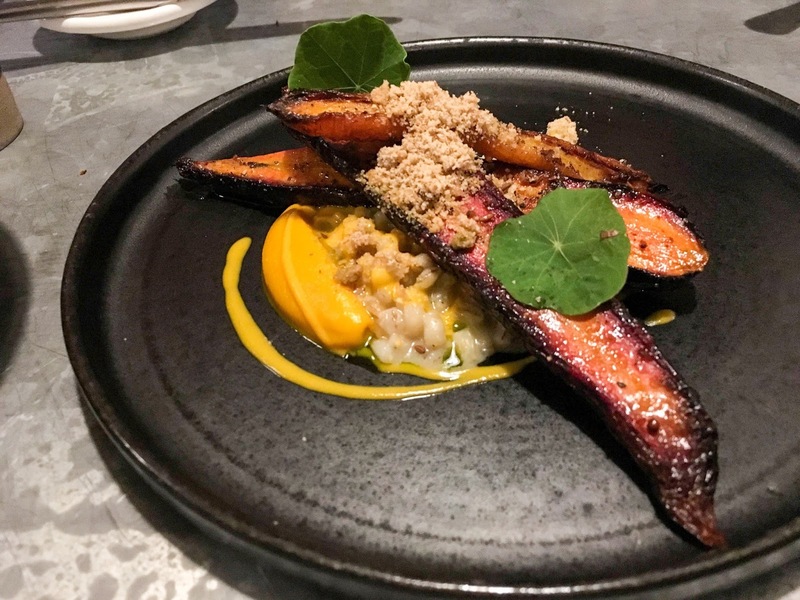 We shared duck foie gras with smoked eel and rhubarb (and a shamefully uncredited supporting role from slivered and pureed beetroot - £14), roasted carrots with vadouvan, medjool dates and barley (£12) plus the two pasta dishes. The foie dish was a highlight. The small, I mean really small, cubes of eel tasted like your clothes might smell after sitting by a campfire toasting marshmallows for an evening. The smoke had imbued every fiber of the eel but left no lingering acrid note. 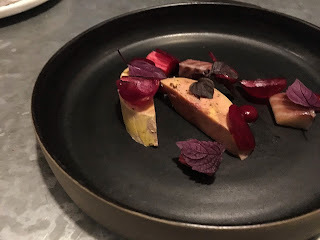 The rich foie, some sweet beet and a counterpoint of a square centimetre of acidic rhubard created The Perfect Bite. 14 quid though and between four eaters my share was the size of my thumb...but barely to the knuckle. The carrots were probably the best of the night, but are the best example of why the sharing concept doesn't work. The smell of the dish was heavy on the curry powder as it was served but this aroma floated away with a bite of the roasted, blackened veg. As I was munching my share of carrot I noticed the pureed date blob hiding on the other side of the plate. I took a little more than my fair share of carrot and smeared on the date and it was like pow, pow, pow Fourth of July time in my mouth. It was only now that the dish really worked. 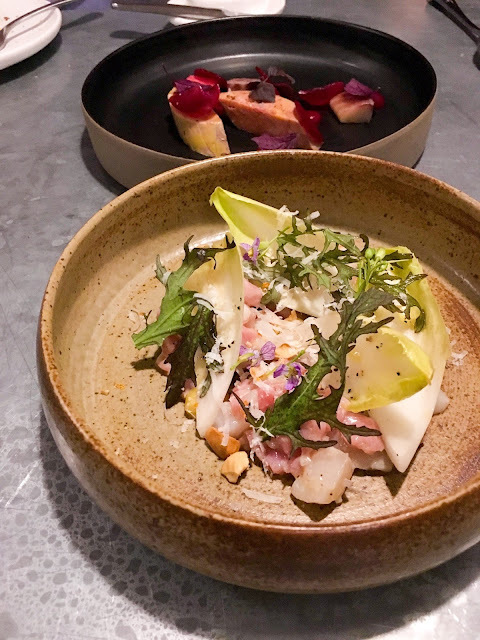 Another dish that proves the sharing advice at Frenchie is broken is the tartare of veal and scallop with miso, endive, Parmesan and Piedmont hazelnut (£14). My first helping of deliciously coarsely chopped meat and bivalve was tasty but weighted more towards surf than turf. The second bite I took was just a mouthful of miso which had been blobbed onto the plate. The balance of the dish, along with its suitability for sharing, would have been more apparent if it had been better mixed before serving. Frenchie isn't aiming for peasant rusticity, so let's mix it up. Our waitress recommended the pasta dishes but they left me a bit underwhelmed. 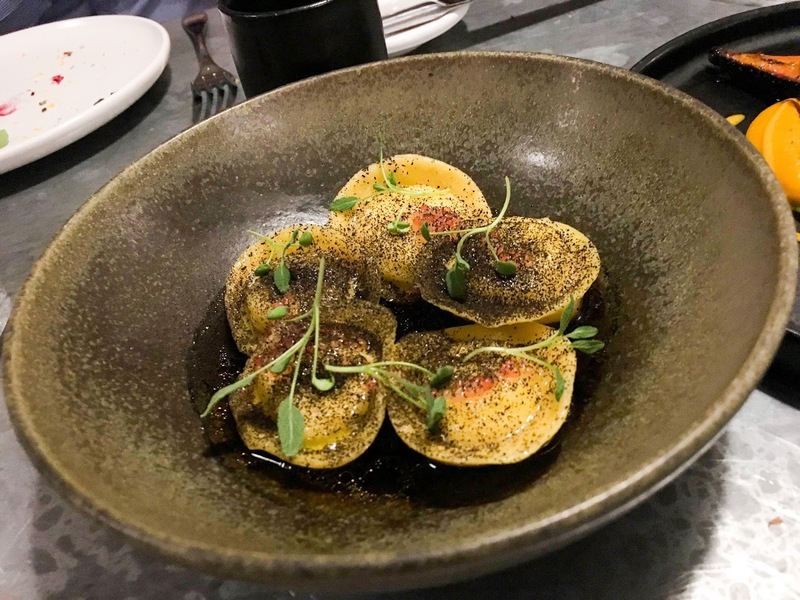 The ricotta tortelli with lapsang souchong tea and lemon caviar (£14) was five, very al-dente pasta parcels bathed in a sauce that was more mushroom umami than smoky tea, but no complaints from me. 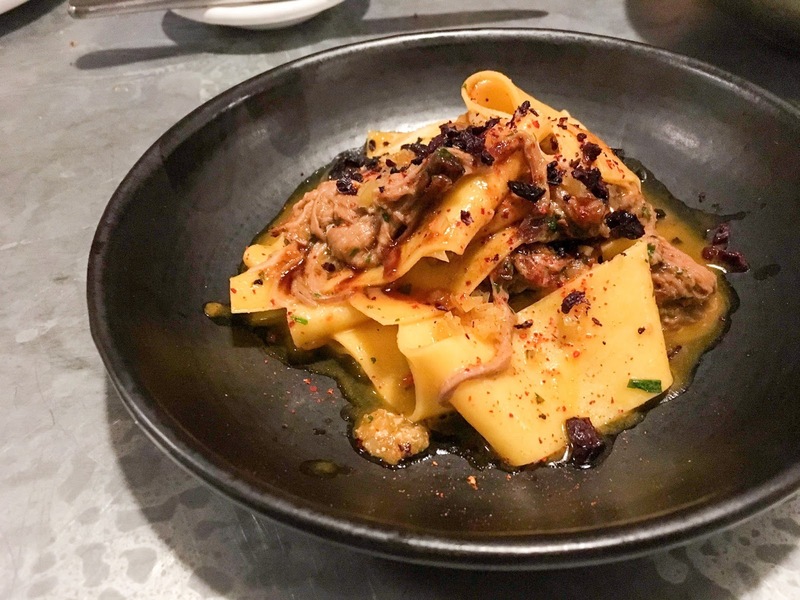 The lamb pappardelle with kalamata olives and espelette was a challenging dish to split between four. Pulled lamb shoulder topped the robust pasta but the whole didn't really pop for me. It was more comfort food oriented than other dishes on the menu. 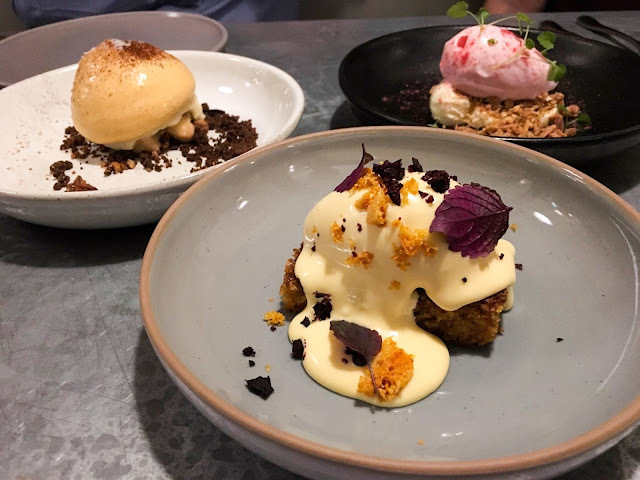 We ordered all three desserts (at £9 each) and I would do so again. The deconstructed banoffee pie was sweet and rich, the new season rhubarb with Brillat-Savarin was actually a delicious deconstructed cheesecake of sorts while the Lemon, yuzu, kalamata olive and honey dish was a polenta cake topped with honey ice cream. All were unusually light. So, that's 11 dishes between four of us and the meal came to £62 a head with two bottles of wine at £50 each (the cheapest pinot on the menu and actually pretty good). We were reasonably sated but that's probably only because we started the evening at Barrafina ordering their crab croquettes. With four famished people you could comfortably order the entire dinner menu. The weight you put on from the food would be easily countered by the lightness of your wallet. Service was slightly manic yet altogether Gallic. I could barely pierce the accent of the sommelier nor our waitress but that was partly due to the pumped up background music forcing its way into the foreground. When Chef Marchand asked "Ça va bien?" on my way back from the toot, I had to remind myself that I was a stone's throw from the Punch & Judy. I replied "oui chef, very good" and meant it. I'm confident that Frenchie is not going the way of Chabanais, which closed faster than I could gather any interest in it. Don't take your time to visit though. It's worth heading down while Marchand is in town overseeing the early days. Hmmm. Spendy for the portions, it seems. I could easily see needing 4 dishes per person if you've not snacked elsewhere first in which case that £62 a head would jump up a fair bit more. But some of the dishes look really appealing, so perhaps it's worth the price tag. Another one to add to my list. Yes I agree with you completely. They just need to bump up the portion sizes for dinner and should be good to go. Lunch deal is still pretty good I think.